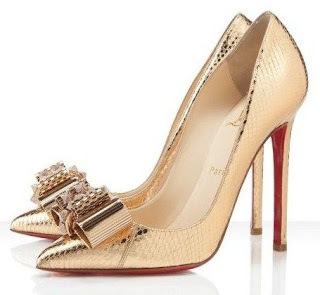 Christian Louboutin adds to his collection for spring summer 2012 one of the most beautiful models of pumps I've ever seen, do you not know, but for me it was love at first sight! They are called Metal Knot and form the model of the iconic shooting decolletes Pigalle, perhaps for this reason it is impossible not to adore them! Christian Louboutin's by the eccentric and whimsical tone that characterizes much of its collections and returns to red carpet shoes create truly delicious that I think we'll see soon at the foot of a celebrity! This is an important year for the French shoe designer, have in fact started the celebrations for his 20 year career and in honor of the event, Christian Louboutin has presented his collection for the anniversary special, 20 model a more beautiful the other representing the years of success that have characterized the launch of its lines. The spring summer 2012 collection is getting out, but especially for shapes and color combinations of impact, for heaven's sake, always adorable, but not all we would have the courage to wear some of the more eccentric! Instead Metal Node win at first sight! They decolletes leather stiletto heel height 12 cm and no plateau! The upper has metallic effect, as the name implies, and is complemented by a nice bow on the narrow tip, a touch of good taste pretty good. The price on the official website, alas, is no less than $ 1995! But dreaming of shoes so it does not cost anything, right? Waiting for your more posts !